For those of you who don't know what it is, it's a cut in knitted fabric. It's used when you knit in the round with the intention to cut it in one or more places before making up the garment. It allows you to work always on the right side, a real advantage for working in two colors. Some stitches are added to each side of where the cut will go. With all but the stickiest, clingiest yarn, some form of stabilization is used. I prefer machine sewing just inside the steek. This can be done before or after cutting. The machine stitching keeps the knitted fabric from fraying. 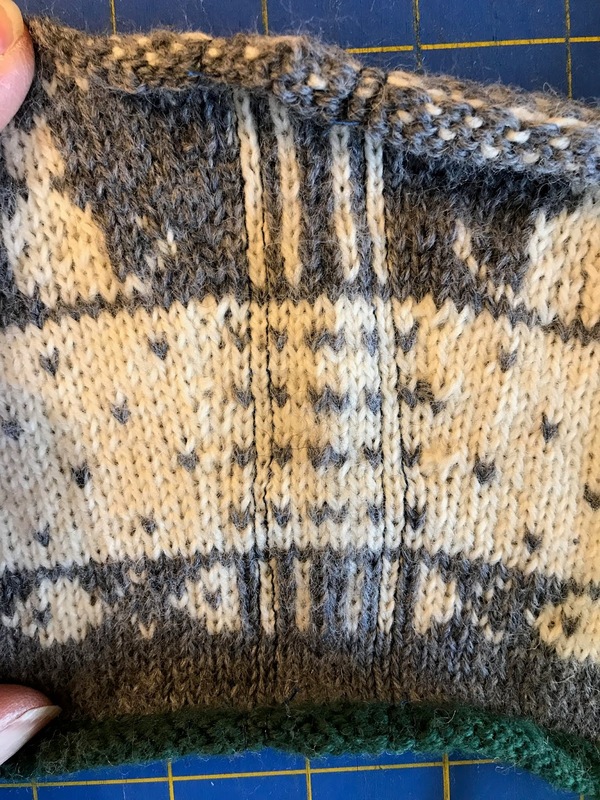 In this project, I knitted the two sleeves together in the round separated by steeks. Here you can see the two sleeves after the first steek was cut. 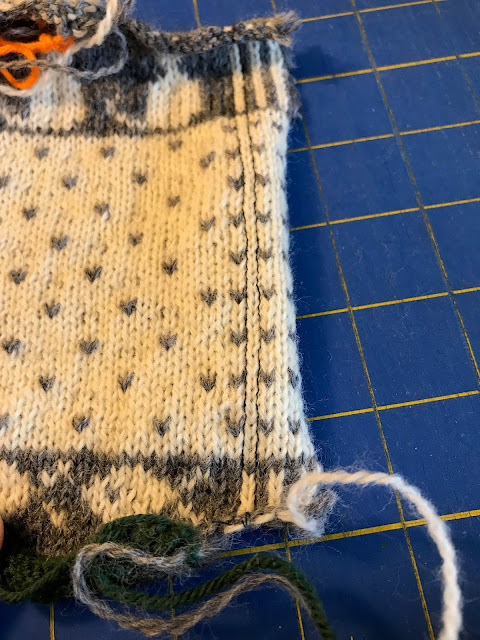 I like to make two lines of stitching in one direction between the first and second vertical row of stitches and between the second and third. I cut the two pieces apart by cutting right down the middle, along the wider dark stripe. I do the same thing with the front. 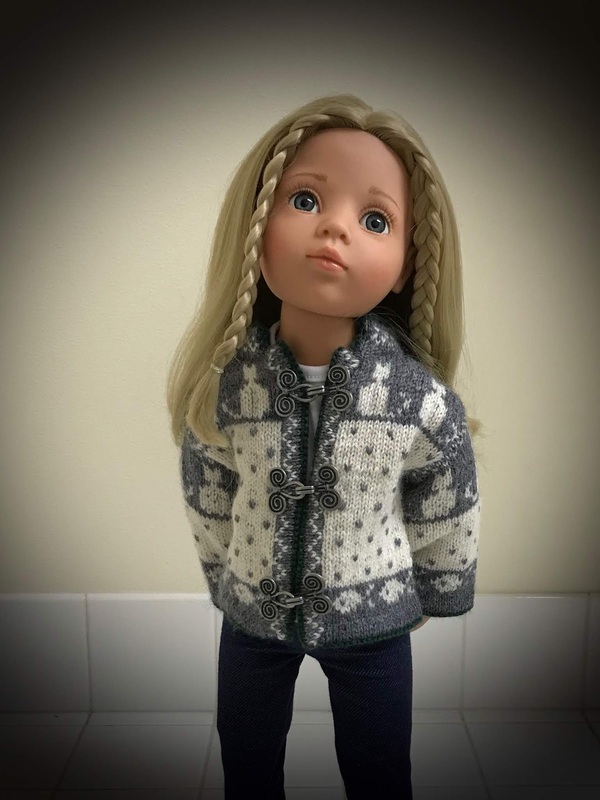 I end up with three pieces for this doll sweater. Then I trim by cutting along the row of stitches between the second and third vertical row when I sew the sleeve seams or when I add the front bands to the body. It leaves a very narrow but stable seam allowance. I do the same thing with the armholes (armscye is the technical term). 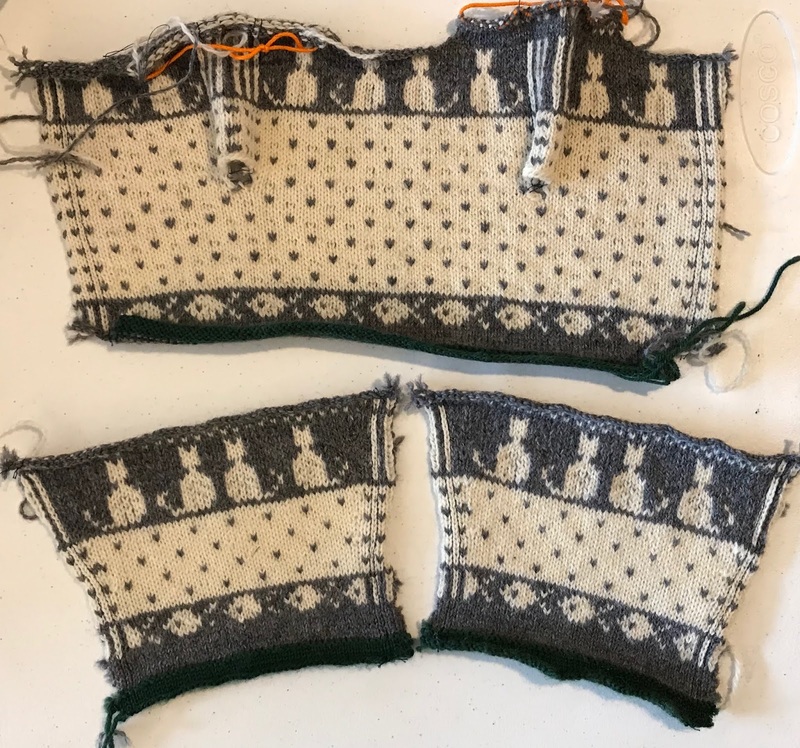 For this project, I grafted the shoulders together first, but they can be bound off and sewn or connected using a 3-needle bind-off. 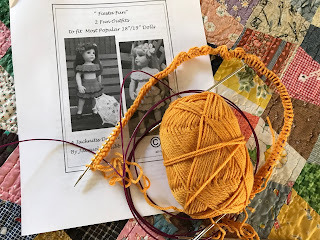 For doll projects, I prefer grafting (using the Kitchener stitch) because there is less bulk. I started this cardigan for Jolena last June. With the move, no access to my sewing machine and other projects, it got pushed aside. However, I finished it this week, so here is Jolena, maybe looking a little proud of her new Finnish cardigan. I called this one Kisu Takki, which means "Kitty Jacket" in Finnish, because of the kitties. 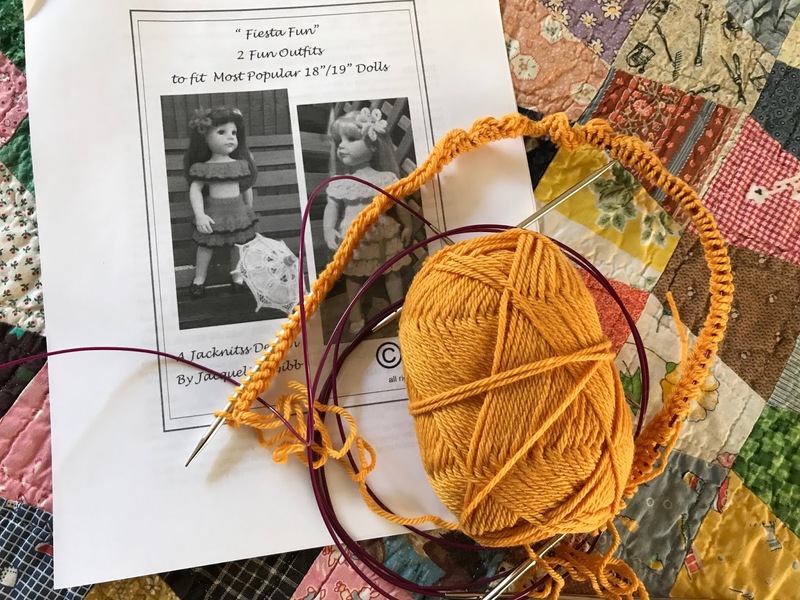 It's a free pattern, suitable for learning to make steeks in a project that is more than a sample and yet small enough not to frighten you to death when you have to cut it apart. As is typical for Scandinavian sweaters, the raw edges of the front steek is enclosed in a knitted band that is folded over on itself. I used a dark green for lining the hems, and the front and neck bands. Before finishing the Kisu Takki Cardigan, I finished up Alister's wardrobe. I was running short of time, so I altered Billy's PJs to fit. All that was needed was to shorten the sleeves. Now I have to make Billy some new ones. 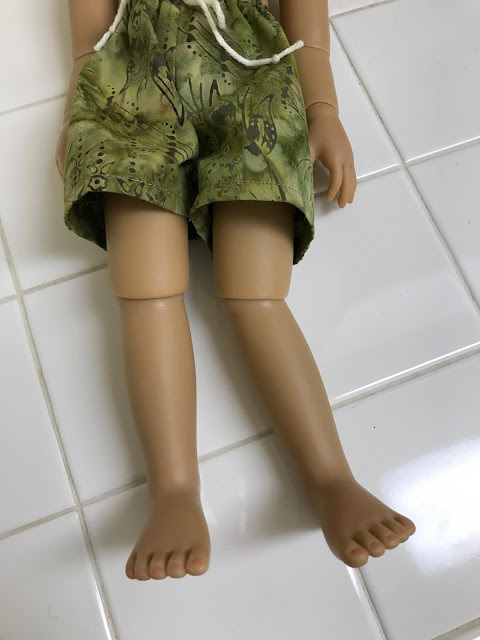 Alister couldn't go to Zachary's home without some kind of bathing suit, so I pulled out more batik from my fabric stash. 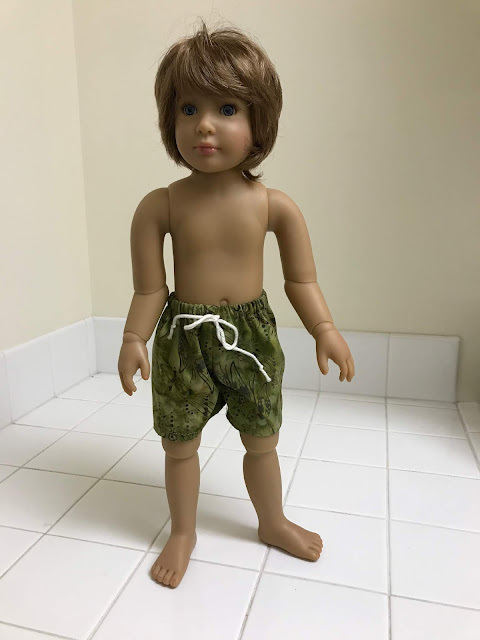 All he needs is a boogie board. All I needed to do was (please skip this paragraph if you're squeamish) pull his leg (and I'm not pulling yours!) until it was out of the socket but still attached by the elastic...um...ligaments, twist it 360º and let it go gently back into the socket. Alister is on his way to his new home, and may already be there, as he was supposed to arrive today. Next Monday is Zachary's birthday, so it's in plenty of time. Alister wrote Zachary a letter describing his life in Houston before he came to live with me after Hurricane Harvey destroyed his home. He is no longer being produced, as Kidz n Cats has stopped production. I guess you could say he is a collector's item now, but he has been looking forward to going to live with Zachary. I'm sure he will have a good life there. 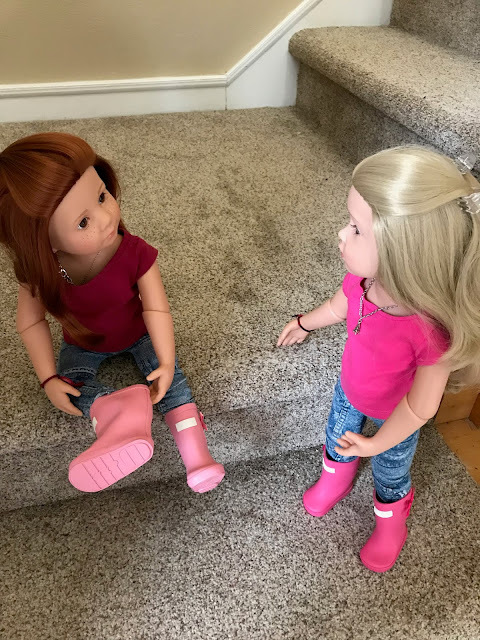 Friday's The Doll's Storybook was called A Good Turn. I enter into the story line by being sick in bed, although I remain offstage. (I'm not currently sick. This is a work of fiction.) Here's a photo from the story. See if you can guess what the dolls are up to. If you only read one of my stories, this should probably be the one. People have been telling me it's the best one. I did have a lot of fun writing it and taking the photos. If you read it, I hope you enjoy it and share it with any youngsters in your family or circle of friends. Saturday, the choir at Trinity sang for the memorial service for the wife of a choir member. It was a beautiful service. I had met her at church, but didn't really get to know her. She was three years younger than I am. She and her husband were on a cruise off the coast of Mexico (if I remember correctly) when she developed pneumonia. She was evacuated by helicopter to a hospital on the mainland, where she succumbed to the disease. Her immune system was compromised due to her second kidney transplant a few years ago. I assume she was on immunosuppressant drugs to keep her from rejecting the kidney. I have my issues, but I feel blessed that nothing that's wrong with me is life-threatening, at least as far as I know. The weather has warmed up. The snow in the yard is almost gone. Friends in Park City have been posting photos of recent snow with huge walls along the streets in our old neighborhood, Summit Park. I'm so glad to be here. 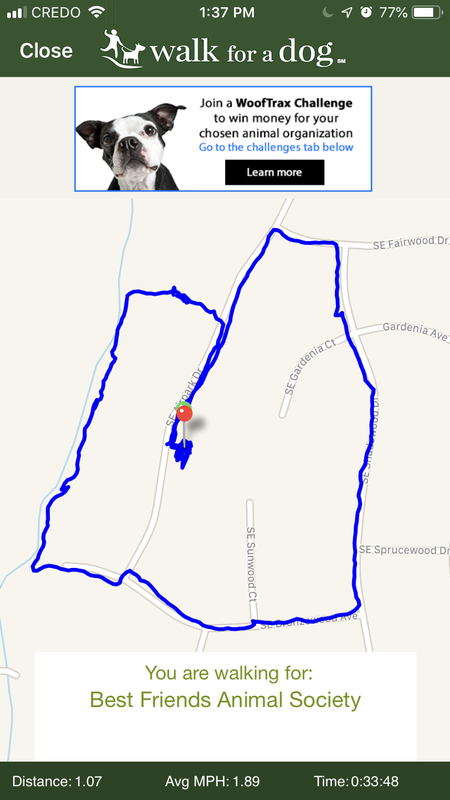 We have been walking just about every day. On Saturday, we decided to hit the Larkspur trail for part of our walk, which brought the total "mileage" to just over a mile. There were some muddy patches, but it was pleasant. I hope everyone is enjoying the spring weather, or if some readers are in the Southern Hemisphere, the fall weather. Happy April Fool's Day! What's on my sewing machine: Clothes for Billy. 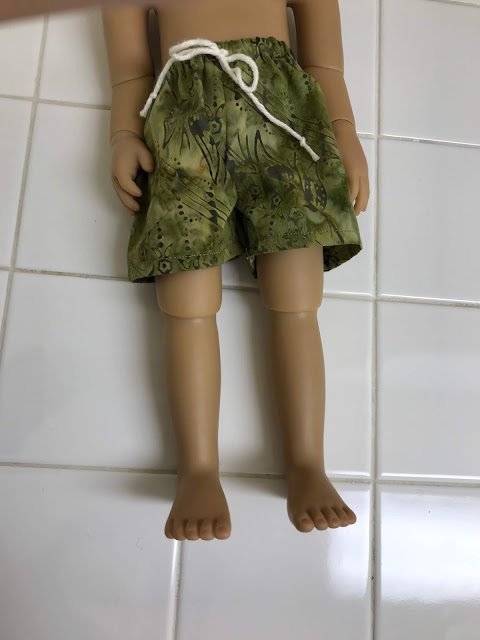 He will be needing new PJs, and I want to make him some Cargo pants similar to the ones I made for Alister, or perhaps Capri-length. What's in my hoop: Still the Spring Flowers quilt. I managed to get a little quilting done this week, but not much. 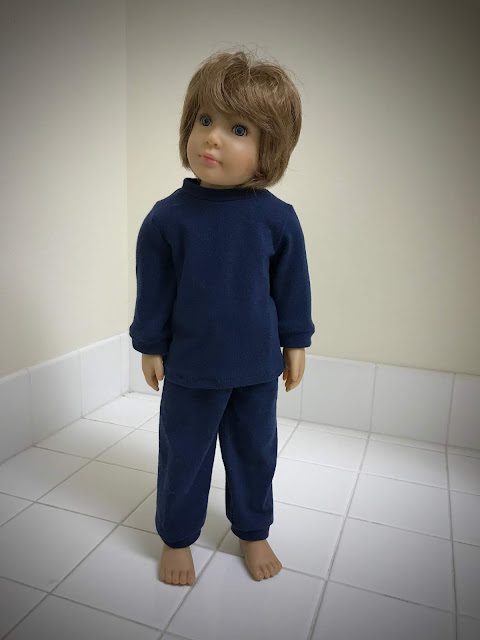 What's in The Doll's Storybook: A Good Turn, where I enter into the story, offstage. What's on my iPad/iPhone: Finished Frankenstein: City of Night, Book Two by Dean Koontz, then Frankenstein: Dead and Alive, Book Three. Now listening to Frankenstein: Lost Souls, Book Four. I expect to finish up the series this week. I enjoy Dean Koontz. His books are full of suspense and horror, but also humor, and his writing is very poetic. This series has a little more humor than usual. What's in my wine glass: Révélation Cabernet-Merlot Pays D'Oc de Badet, Clément & Cie, Elevé dans nos chais ("Raised in our cellars"), 2017. Very nice. From France, in case you couldn't figure that out. What's my tip of the week: A while back I mentioned that when I remove the kitchen trash bag, I put four bags in the bottom, folded one at a time, before lining the trash can again, a technique I learned from motel stays. I recently came across this quick way to line the trash can with the new bag, and I've been using it. Maybe you will want to give it a try. So easy a kid can do it. 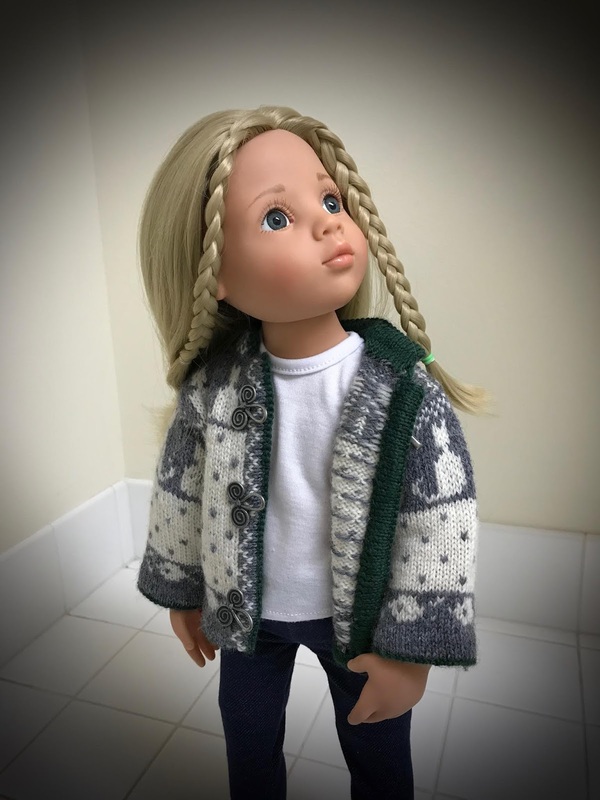 Or maybe a doll? Good to see that you are overachieving as usual! Keep up the good work.